I was faced with a true dilemma. We were packing up to vacate our vacation the next morning, our condo cupboards were almost bare and I still had to create something for this food blog. Normally, I love these conditions. They make me feel like a contestant on the show, “Chopped,” where chefs are forced to create a 5 star meal out of five unlikely ingredients in a basket. Say, pickled pig’s feet, Lucky Charm’s cereal, passion fruit, Worcestershire Sauce, and edible fern fronds. 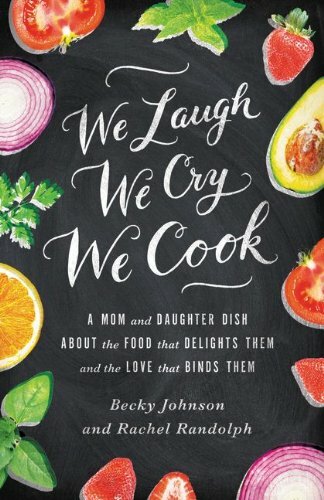 My “basket” was not as challenging as that list, but I was at the end of our book deadline for We Laugh, We Cry, We Cook. (Lord willing, it will be turned in by the time you read this!) The manuscript was absorbing every available brain cell leaving me with precious leftover neuron’s kitchen creativity. My available list of ingredients were: mustard (2 kinds), Ranch Dressing, Peanut Butter, Jelly, Bread and four iffy apples. What can I say? My daughter is brilliant. And thankfully, since I am not a contestant on “Chopped,” I am not required to incorporate Ranch dressing, mustard and iffy apples into this recipe. I had just enough stuff to make two French Toast PBJ Sandwiches for our final morning of vacation, and they turned out, well….. quite fabulous, actually. 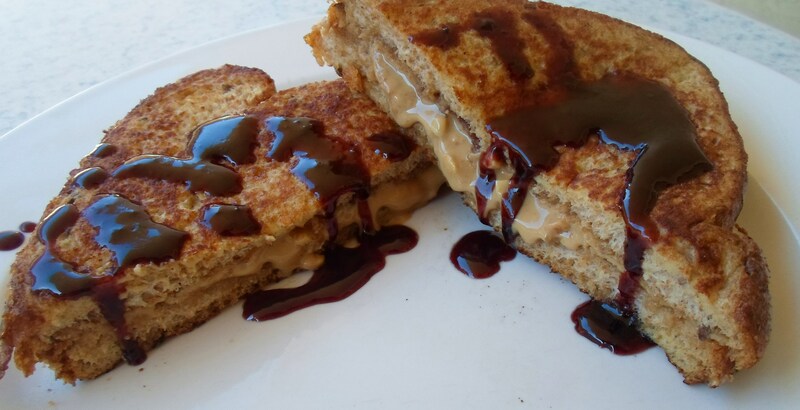 Greg loved it and said, “I’d definitely enjoy eating that again!” It’s a fun way to fancy up a PBJ for kids, or when you are hankering for something a little sweet as a midnight snack with a glass of ice cold milk. We often do “breakfast for supper” on Sunday nights, and this would be a perfect recipe for those occasions, perhaps served with some sliced oranges and bananas. One half a sandwich was plenty filling for me, so if you make this for light eaters or children, one portion could easily feed two. Put butter and oil in skillet and heat until bubbly and melted, stirring to mix them. 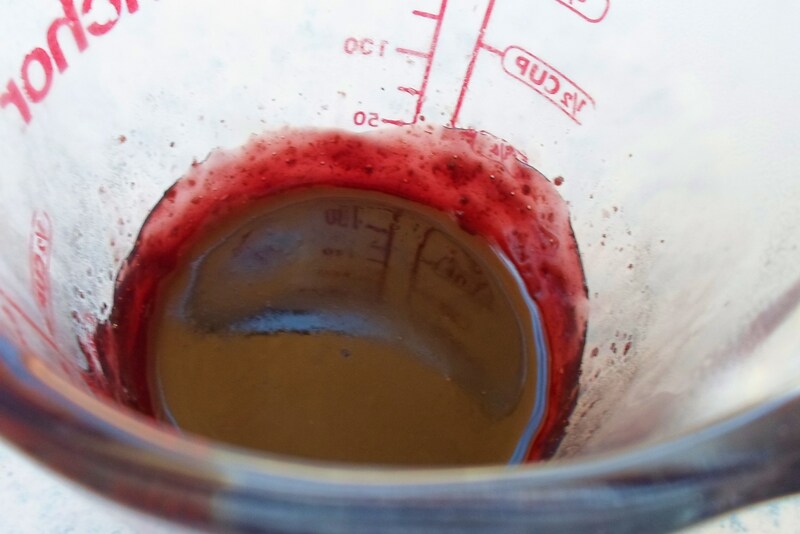 (The oil will help the butter keep from browning and burning.) Beat one egg with the milk in a shallow wide bowl. 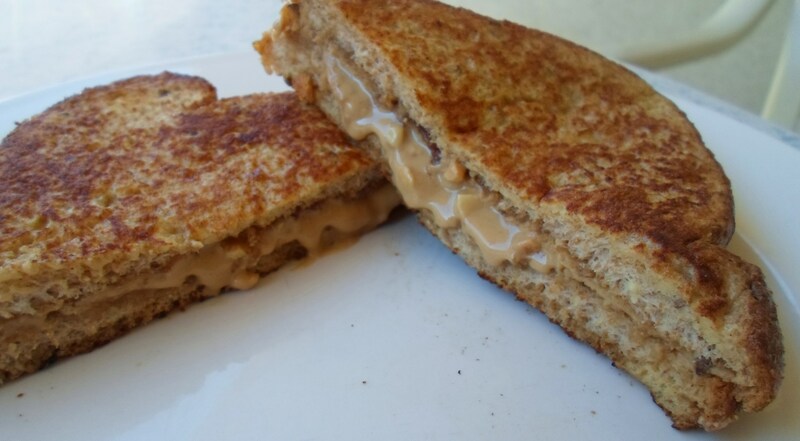 Make two peanut butter sandwiches, using as much peanut butter as you like. Dip the whole sandwich, both sides, into egg mixture and place in skillet. Do the same with the second sandwich. Turn over when one side is golden brown. 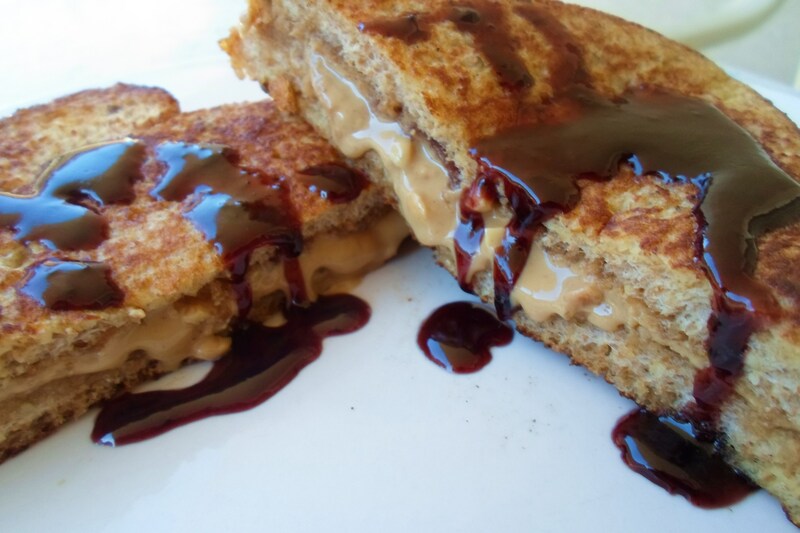 While the French Toast Sandwich is cooking, place jelly or jam in an oven-proof bowl or measuring cup. Heat for 10 seconds at a time until it is hot, melted and the consistency of a thick syrup. When sandwiches are cooked on both sides, move to a plate and carefully cut at a diagonal, propping one corner up on the other for a nice presentation. Sift a little powdered sugar over all, if you like. (Alas, I had no powdered sugar in my “basket.”) Slowly pour the hot melted jelly in a zig zag pattern over the French Toast Sandwiches and serve warm. My kids will think I walk on water. Thank you!